For an Institute, increasing student’s application and ultimately, increasing the enrolment are the primary goals. In fact, getting the number of applications and conversion into enrolment are the topmost challenges faced by the academic institutions in India. However, it would not be a right approach to consider students enrolment as only criteria to judge digital marketing investment. To drive up quality student applications for MDI Gurgaon. It’s vital for any institute to get a large number of quality applications, so that best can be chosen out of these. To engage the target audience with social media channels. To resolve the queries of students and provide ease of admissions. Run a campaign to enhance admission ease and number of applicants for 2019. When it comes to investing two crucial years of ones’ life and a hefty sum of efforts and dedication, students look beyond the conventional parameters. They look forward to something more, something they want to be associated with. For Gen Z, this has become more relevant and to create a difference is the need of the hour. From institution side, it is important to look for a right candidate, and such pool of aspirants can be rightly traced and reached via Facebook, that’s what MDI had done. The students experience about the MDI has been shared, a strategic content marketing has been placed for enhancing the richness in the overall post. The experience has been denoted in terms of craziest and memorable time at MDI, how these two years would be at MDI. Social Media buzz by creating the appealing post and counting days to launch the query sessions. Cross-link of application form on social media post. It has created a Page “MDI Gurgaon Admissions” to solve all queries related to admissions. They have also mentioned the link verification post and other queries related to admissions. That actually help the candidates to go with easy admission process at MDI. The posts are self-sufficient in terms of content which are well designed to ensure that the student gets a complete clarity of what lies ahead. 60% Students rely on Social Media platforms to know more about the Institute. The focus was to inform the aspirants about what the two years ahead would look like and how does MDI differentiate itself from the league. The idea is to build awareness about brand MDI Gurgaon and the connections associated with it. The connection between the posts and the countdown helps in unraveling the enigma gradually, which helps students to take an informed decision. Majority of a target audience is active on Instagram, so pitching through Instagram was add on the strategy to improve admissions and look for quality intake. #ExperienceMDI is a well-executed campaign around what life at MDI is and what differentiates MDI form the other top B-Schools. The design and the overall aesthetics are appealing too and the constant underlying theme helps connect to the campaign. 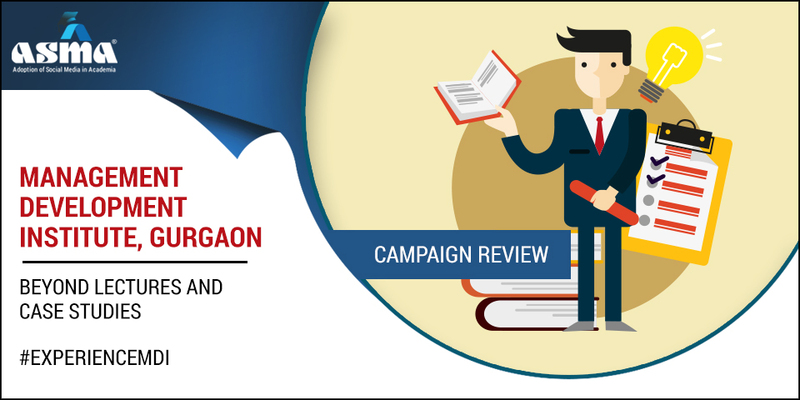 The campaign facilitates starting a conversation on social media handles especially on Facebook, thereby creating brand awareness, thus helping in one of the most important facet of education institutes, boosting admissions.